We will explore how InterSystems IRIS paves the way for innovation by supporting open analytics, sharding, docker and cloud deployments, to name but a few. Expect an interactive learning experience with insightful presentations and live demos. To register, simply send an email to marie-laure.kinkel@intersystems.com. The event is free of charge, but has only a limited number of seats available, so make sure to sign up NOW! We will also provide you with a FREE CEBIT ticket upon registration. 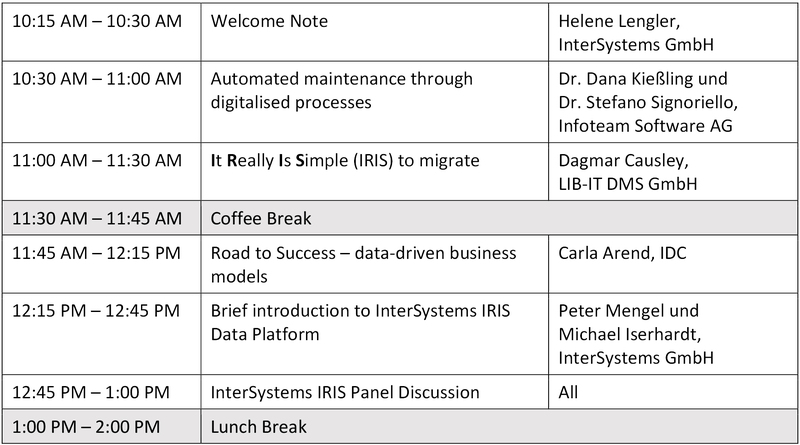 What’s more, you will also get the chance to delve into InterSystems IRIS yourself: Sit down in our Sandbox area at stand C49 in hall 13 and take InterSystems IRIS to the test. ​View the original agenda of the event in German here. We look forward to welcoming you in Hannover!